When our first anniversary rolled around, Bryan and I decided that we really wanted to take the opportunity to jot down a few thoughts and memories. We value stories and memories, but time passes by so quickly and important moments one year can be easily forgotten five years later. The project started as a notebook, with similar questions jotted down year after year with our handwritten responses. It was an okay start but it just didn’t make this crafty gal happy so I decided it was time to overhaul our Anniversary Journal into something pretty! 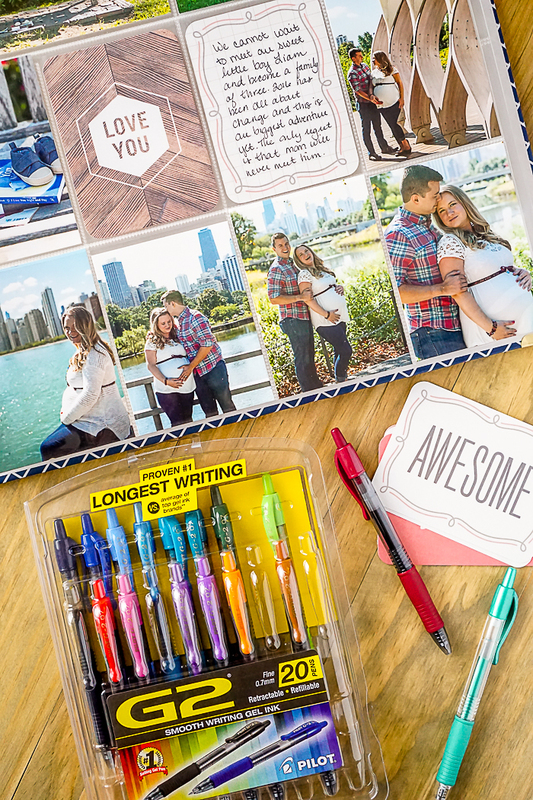 I used to be a die hard scrapbooker with paper for every occasion, die cuts, photo stickers and markers that always dried out quickly. All of that it just too complicated and time consuming for my life now. 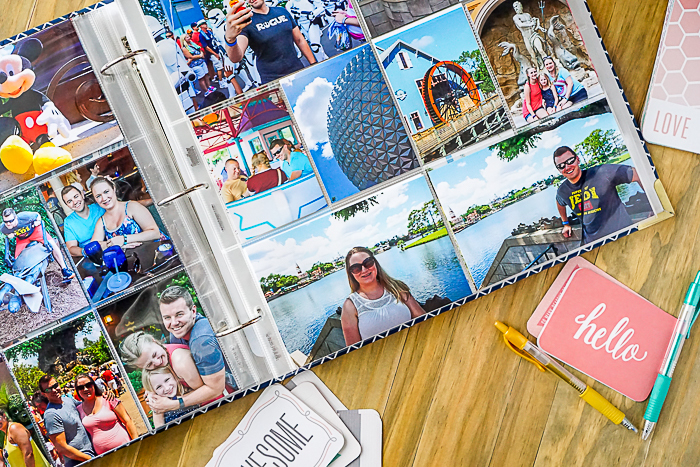 I decided that using a photo album with predetermined slots for photos and journal cards was the perfect balance between creative and pretty with a simple process. 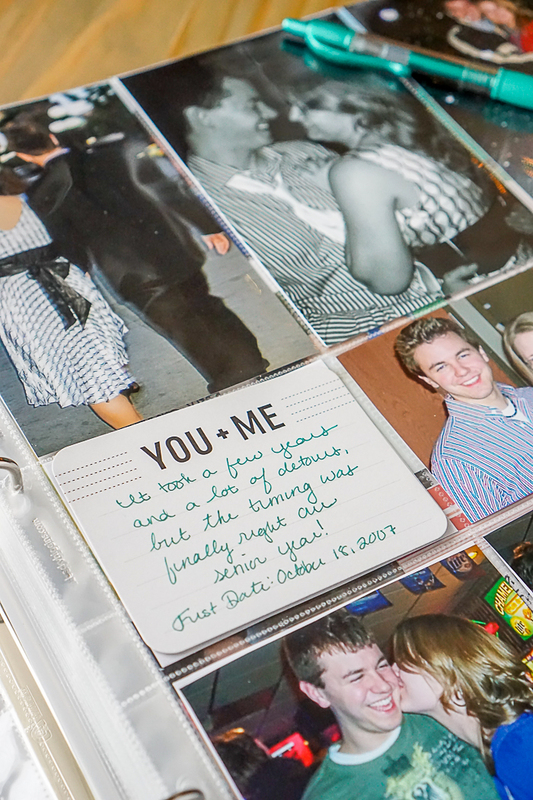 Our Anniversary Journal consists of a couple opening pages that summarized our relationship before we got married – a spread for college dating, for the years after college with journal cards that summarized important events from those years, for our engagement, for our wedding and for our honeymoon. First one has journal cards that discusses the events of the calendar year (for example, January 2016 to December 2016) and has pictures from January through May. Second one has journal cards about how we celebrated our anniversary and discussing that year of marriage with pictures from June through December. We will sometimes add an additional spread for a year if something extra big happened, like a vacation where we had lots of photos we loved, or if we had professional photos taken, like our maternity photos from this past year. What are the big moments or events of this calendar year? How did we celebrate our anniversary? What were some of our favorites? Books? Movies? TV Shows? What did we accomplish this year of marriage? What are our goals for the coming year? Did we meet our goals from last year? What weddings did we attend? Did any of our family or friends have a baby? We normally jot down the answers in quick notation form on scratch paper and then we (I) transfer our answer in legible form on our journal cards. 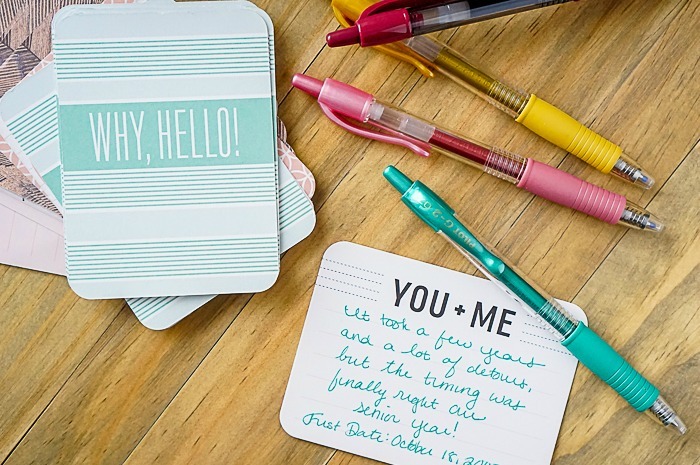 Back in the day, I would have boxes of scrapbooking markers to choose so I could write in pretty colors. But those markers would always dry out quickly and never offered as fine a tip as I would like for clear writing. Enter Pilot G2 gel ink pens! The Pilot G2 gel ink pens are the best – smooth, long lasting, comfortable to use, and colorful! The ink is specially made using pigments instead of dyes, which is what gives the ink that vibrant, beautiful color. 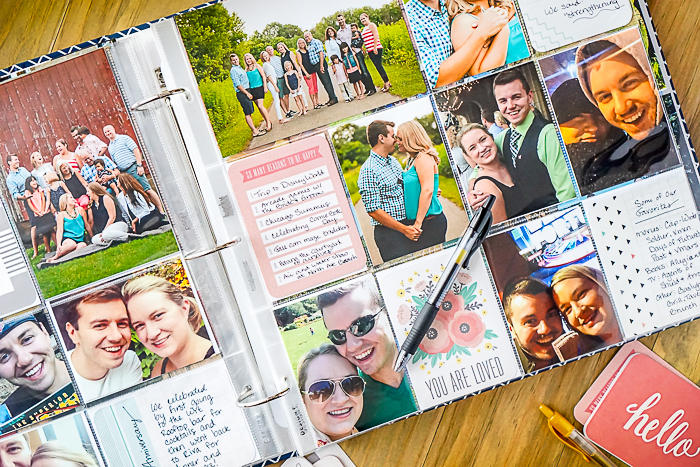 Truly, they look amazing inside our anniversary journal, but I also love them for my planner and for color coordinating my to-do lists and shopping lists. Yes – I’m an overachiever and so are these pens. Pilot G2 pens would make a great holiday stocking stuffer for the creative adult in your life or if they just love writing utensils like I do (I know I’m not the only one out there!). 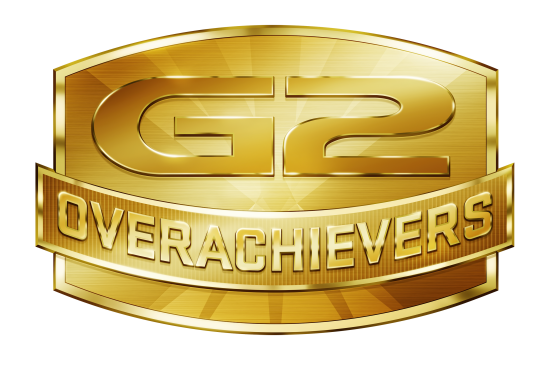 You can even buy them before the end of the year with this coupon code for 20% off ALL G2 products. Just head to PilotPen.us and use coupon code G2SWAY. This is actually the same format I will be using for Liam’s baby book and using my Pilot G2 gel ink pens as well so keep an eye out for that soon! 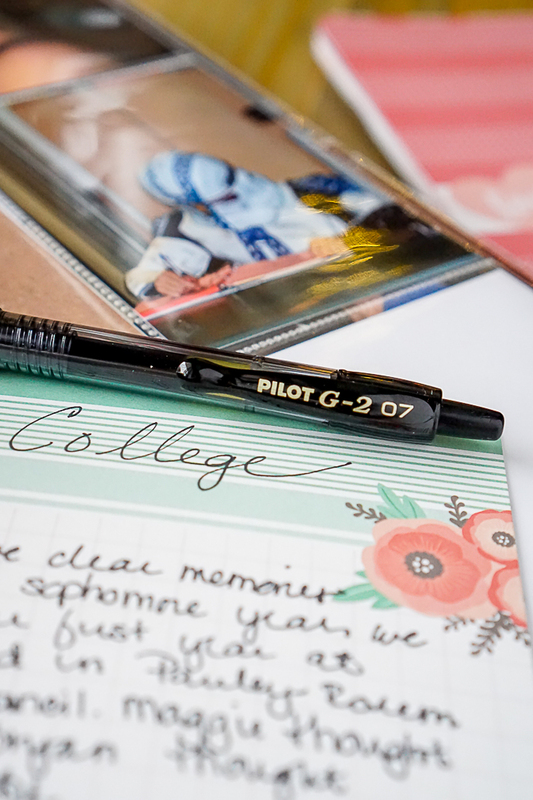 In the meantime, connect with Pilot Pen on Social Media – Twitter, Facebook, Instagram, and Pinterest.